Losar is here again. And it is time for people to enjoy. Have fun. Eat and forget anything that troubles them. Those days Losar was considered the beginning of a New Year and was celebrated thus. But today, it no more feels like one for the educated lot living, working and raising family in towns and cities. They celebrate New Year on January 1. Of course the joy and celebration have not died down. People still consider it as a time to have fun and enjoy. For many Losar is just another public holiday. One Lopon at Sherubtse College thinks Bhutan’s Lunar New Year actually falls on the first day of the twelfth month on Bhutanese calendar. His justification is logical. We celebrate the day as the Traditional Day Offering. Some call it Sharchopa Losar. What amuses me though is our preparation for the day. Scores of pigs, bulls, are slaughtered to meet the rising demand. 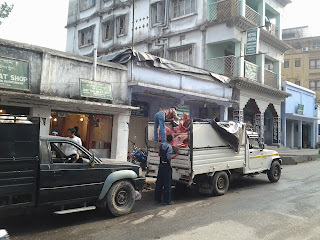 And from the eve of Losar, another holy month (that prohibits the sale of meat in the market) sets in. 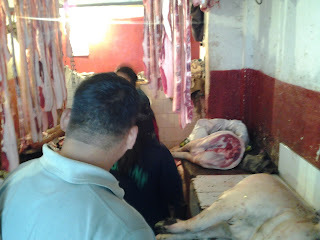 So, there is a huge rush for meat in all the shops. Some are stocking up their meat supply that would see them through the holy month. Sometimes I wonder, of all foods, why meat (beef or pork) is considered a dish that befits Losar. And as a Buddhist nation where compassion becomes the core value this is something that we really need to think of. It is true that not everyone can turn vegies overnight, but how about removing meat from your meals at least for this auspicious and holy month? I am a Buddhist and I am hypocrite eating meats. Ngawang P Phuntsho: I am dilemma because i cant regain my health if i become vegetarian and it is must for me.. There is no option for me but i always pray before i take the meat knowing that somebody had slaughtered in an abattoir.